The following are current and ongoing opportunities either programmatically or topically related to the work of the CBSC Fellows. These are not exhaustive but demonstrate activities and programs past or current CBSC Fellows have completed. The Woodruff and Whitehead Foundations Fellowship is intended to provide work experience to recent college graduates interested in the nonprofit and philanthropic sectors. The Foundation employs two fellows who work closely together to assist staff in a range of foundation activity. Applicants should be bright, curious, self-motivated and have strong written and oral communication skills. The info sheet from the foundations can be found here. 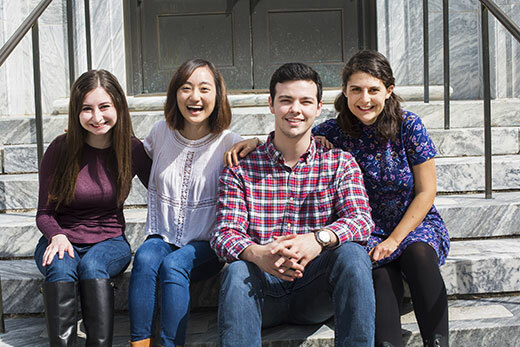 Emory has an internal review process as the University submits two students as Emory nominated submissions typically with a cover letter by Emory’s President. Information on submitting your materials for consideration of an Emory supported nomination can be found in the FAQs sheet here. The foundations only consider applicants graduating the year of their application or very recent graduates for this opportunity. CBSC Fellows and other students with heavy community engagement have done quite well in the selection process in recent years. The current WWF Fellows will be on campus for an Information Session on Thursday, November 8th, 11:30 a.m. to 1:00 p.m. A RSVP is required by November 6th 12 p.m. and can be submitted via this form. The same form, even if unable to attend the Info Session, will generate an invitation to submit materials to the Emory Nominating Committee so please complete if interested. The 2019 contact at Emory for the University nomination process is Kate Grace - kdgrace@emory.edu. The Robert T. Jones, Jr. Scholarship was established in 1976 to honor the late Robert T. Jones Jr., an internationally renowned golfer, Emory alumnus, and extraordinary human being. Each year, the Scholarship provides a fully paid year of study for four Emory students at the University of St Andrews in Scotland. The Robert T. Jones Trust recognizes individuals who will be excellent representatives of Emory University at St Andrews. In general, the qualities required to fulfill this ambassadorship include academic excellence and exemplary character, integrity, and citizenship. To date there have been eight CBSC Fellows named as Bobby Jones Scholars. For the past several years, at least one CBSC Fellow has been named - including Blake Mayes, Rachel Cawkwell, Peter Habib, Adam Goldstein, Julianna Joss and in 2018 Jason Sell. Information on this program can be found here. The application deadline is in January 2019 but any interested students should attend information sessions, if possible in advance. Emory students working with nonprofits in community to understand local housing needs. Emory’s Office of Civic and Community Engagement is the home for the CBC Fellows program, but also runs other initiatives with heavy community engagement. If you are interested in hands-on work in local public schools, teaching debate to elementary and middle schools or working with new Americans on their language skills, CCE has a program for you. Please visit the CCE main website here for more information or stop by our office in the AMUC suite 110 to talk with any of our staff.